If you are considering buying an above ground swimming pool, be sure to get all the information you need to make an educated decision. In addition to the request for information, we will send you a complete guide to swimming pool ownership, for free. Below is some information to consider when purchasing an above ground pool. Pool Style There are two types of ool structures, steel and resin. The available models are Jacuzzi J-2000, Aqualeader Blues and the Aqualeader Sentinelle. Accessories All our pools come with the necessary accessories to get you ready for the season. We carry additional accessories such as a heater, salt water system, an automatic cleaner and underwater light. In the Notes area to the right, please add any information you feel necessary. 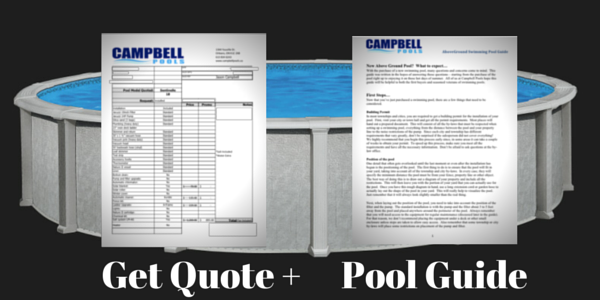 Once you submit the form, we will instantly send you a pool guide for you to review while we prepare your quote. A member of our team will contact you as soon as possible to give a price estimate on what your asked for.